Warning Signs: When is it Time to Replace Your Roof? When shingles start to buckle, curl, bald and break, it is time to get a new roof. 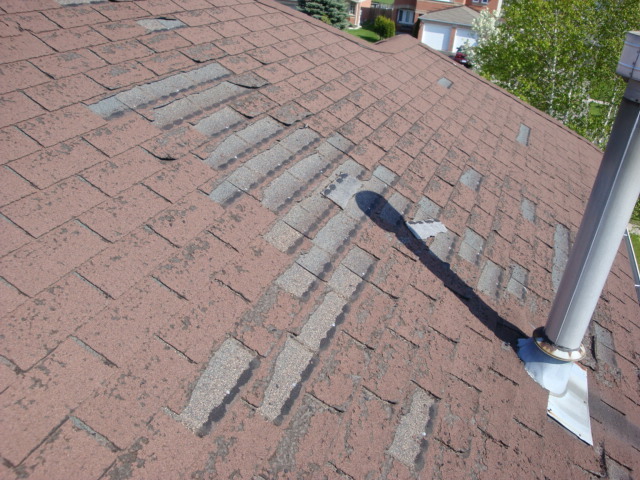 Valleys may be cracked and deteriorating and you are finding pieces of shingles on your and your neighbours’ grounds. It is best to replace your roof as soon as you start to see these signs to avoid leaks that could potentially destroy ceilings, walls, floors, electrical wiring and anything else contained within the house. Additionally, mould and mildew can travel down spaces with water and leak into your drywall, woodwork, and so on, creating further costly damage. 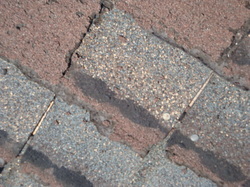 Notice how once the 'tab' or lower color portion of the shingle is removed, the joints between two adjacent shingles become exposed. The edges have deteriorated, leaving the underlying plywood exposed.